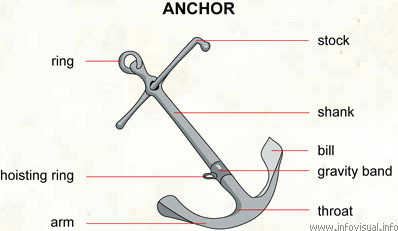 Anchor - Visual Dictionary - Copyright © 2005-2016 - All rights reserved. [img]https://infovisual.info//storage/app/media/05/img_en/074 Anchor.jpg[/img] [url=https://infovisual.info/en][/url] - [url=http://www.infovisual.info/]Visual Dictionary[/url] - Copyright © 2005-2016 - All rights reserved. Anchor: steel or iron hook, attached to the ship by a chain, that holds the ship in place by hooking it to the bottom of a body of water. Stock: fixed bar or movable bar that can be planted along the shank. Bill: end of an anchor. Gravity band: centre point of the mass. Arm: part between the bill and the throat. Hoisting ride: used to lift the anchor. Ring: iron ring at the top of the shank.